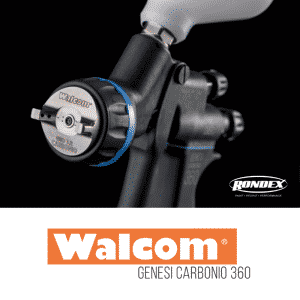 Geo Walcom of Italy announced that Rondex, will be the exclusive Canada distributor of Geo Walcom’s Genesi Carbonio 360 line of spray guns as well as the full line of Geo Carbonio spray equipment. Through its extensive nationwide sales force, Rondex will be working with jobbers to market this line to body shops and collision centers domestically. The Genesi Carbonio 360 features a metal core and is over-injected with carbon fiber with a focus on ergonomics, alleviating the wear and tear on painters’ backs, shoulder and arms. It also features a sophisticated shape, is designed with an attention to detail, and is 100 percent made and engineered in Italy. 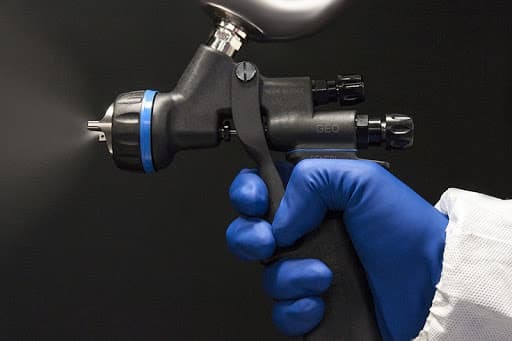 After years of extensive testing with all of the major paint manufacturers’ products throughout the world, Geo Walcom said it believes this line will quickly become one of the leading spray guns in the country. Four different models meet every painter’s needs and style of spraying: the HTE Base for basecoats; HTE Clear for clearcoats; HVLP for basecoats; and the GEO designed for base coats and clearcoats. At 12.6 oz., it is on average 40 percent lighter than its competitors. Forged aluminum body processed on 5-axis CNC, over-injected with carbon fiber. A combination of resistance, reliability and lightweight. Matte galvanized aluminum knobs stainless steel threaded axle. Internal aluminum bushings with stainless steel helicoid (self-locking thread) for high precision control, stable over time. DGT digital pressure regulator, with quick disconnector for gauge release and M1/4 (30°) swivel adapter. 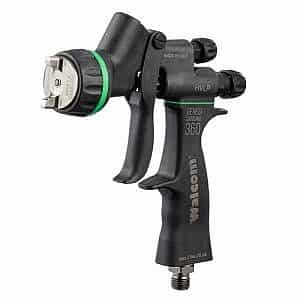 Keeps the essential key features of a spray gun, such as the stainless steel needle-nozzle, the brass air cap with a carbon fiber ring, etc. Unachievable spraying and atomizing performance, with transfer efficiency over 70 percent. Just letting you know I had a chance to use the Walcom’s for week. They are really good spray guns. I honestly produced some of my nicest work. The clear gun actually atomized the material too well in turn made it hard to match factory texture. They are a little slower delivering the material but the end result does weigh that out. Not my spraying at all but it was the guns for sure. The HVLP base guns are equal to any HVLP I have ever used. Overall these guns I would say are very good, equal in most areas and better in some. I would be very confident selling these moving forward. Walcom Genesi Carbonio 360 stock has arrived! Get ready for the game changer spray gun in the market! Call your local Rondex Sales Representatives to order yours today! For more information, contact a Rondex representative today. Rondex is your number one destination for autobody shop supplies and equipment. For over 47 years we have provided innovative autobody paint supplies and equipment to Winnipeg, and throughout Canada with branches in Nanaimo, Victoria, Hamilton, and Toronto. Contact us today to see how Rondex can put our expertise to work for you. Become a VIP member to access online-only offers. You will receive tips and tricks, information about new products and special events, and a code granting you access to exclusive VIP-only discounts.